McAfee WaveSecure is a premium anti-theft application which is now available at 20% discount on the 1-Year subscription. Once you have logged into your account, click on the BUY tab and navigate to the STORE page where you need to look for the link that says 'Got a promo code? Click here' which should be located below the annual subscription price text. After clicking on the link, the page will refresh and a text box will appear where you can use a promo code. Use the promo code 'WS-TWITTER' and click on the Update button. The page will again refresh and you should be able to see 20% discount on the regular price. 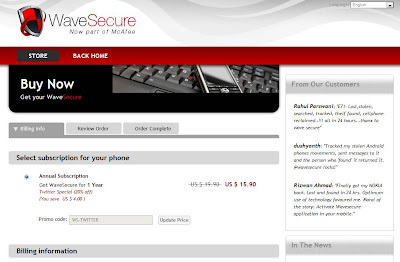 Get $4 exclusive discount on McAfee WaveSecure as a Nokia N8 Blog reader. 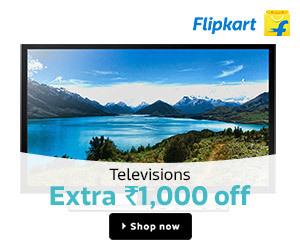 This discount is valid till 31st Jan 2011. Beyond this date, you can still get 20% discount by using the PROMO code WS-TWITTER following the process as described in the beginning of this article. I would like to thank McAfee Wavesecure for sponsoring the discount for our blog readers.